Help! I found a baby bird, what should I do ? Is the bird fully feathered? Does the bird appear to be unable to fly? Can it only fly for short distances? Are parent birds nearby? If YES, then it is normal for baby birds to spend a certain amount of time on the ground when they initially leave the nest. This is called the “fledgling” period and can take from a few days to 4 weeks (depending on the type of bird) before the baby has learned to fly well. As long as it appears to be unharmed, do your best to keep children and pets away from the baby and leave the area. The parents will not feed or care for the baby while people are in the area. If you are still in doubt, then contact your local wildlife Rehabilitators for more information. Does the bird have little or no feathers but appears healthy, alert and active? If YES, then attempt to locate the nest. An uninjured bird on the ground with little or no feathers needs to be returned to the nest. Look around in trees and bushes to see if you can find the nest. Check eaves troughs and small openings in any nearby structures. If so, then you can simply put the bird back in the nest. First make sure that the baby is warm to your touch, if it is not, then use your hands or a soft cloth that has been placed in the dryer for a few moments to warm up the baby. Returning a cold baby to the nest might cause the parent to push the baby out again, as it is trying to move a cold object away from other warm eggs/babies. Then you can construct a suitable nest that is close to the size and shape of the original nest (note: if you do not know what the original looks like please contact a rehabilitator for advice). Margarine tubs (with drain holes punched in the bottom and securely attached to a branch as close as possible to the original nest) or hanging baskets filled with dried grasses, leaves, etc. make a fine substitute nest. Contrary to popular belief, the parents will NOT be frightened off by your “scent” (most birds have a poorly developed sense of smell) and will return to feed the baby if it calls for food. Watch from indoors to see if a parent returns (be patient, it may not happen immediately). 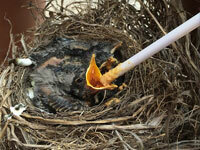 If a parent bird does not visit the nest for more than half a day, contact your local rehabilitator for advice.